8226 Germantown Avenue Philadelphia, PA 19118-3402. John Story Jenks Elementary School. Nestled along Germantown Avenue, in Chestnut Hill, is an eclectic assembly of shops, galleries, markets, salons and restaurants. For more information about the extraordinary shopping in Chestnut Hill, click on the link below. 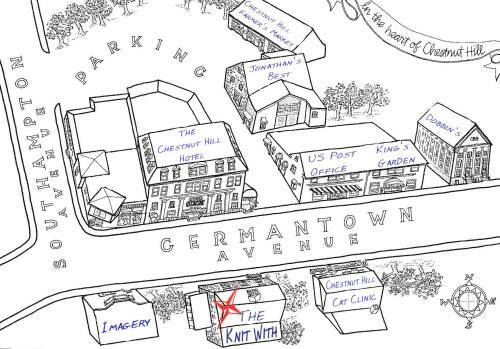 The Knit With is located in the very heart of Chestnut Hill, in Northwest Philadelphia, and is easily reached by both public and private transportation. Below you will find printable maps to Chestnut Hill. By public transportation, The Knit With can be reached by both the R7 (Chestnut Hill East, deboard at Gravers, climb the stairs, turn left, walk three blocks to Germantown Avenue, turn left, walk one block to 8200 block of Germantown Avenue, The Knit With is on the right hand side of the street) and R8 (Chestnut Hill West, deboard at the end of the line, walk up the ramp or stairs to Germantown Avenue, turn right, walk four blocks, to 8200 block of Germantown Avenue, The Knit With is on the right hand side of the street.) regional rail lines. The Knit With is also accesible by bus routes 23 and 77 (deboard at Southampton Avenue) and Routes 94 and L (deboard at Chestnut Hill loop, follow directions for R8). You can contact SEPTA directly at (215)580-7800 or on their website: www.septa.org. We are only a hop skip and a jump from center city Philadelphia and convenient to the Blue Route(476), and PA Route 309 Expressway, the PA Turnpike, and the Northeast Extension. See the maps below to find The Knit With, in relation to your location. For more driving explicit driving directions, please feel free to call us at (215)247-YARN(9276). Click on your area to view and print directions from your neck of the woods!